The most famous stuffed animal superstar on the Internet!!! ← I have fans in Oklahoma! This is a photo of the sign at Goldens Bridge. Goldens Bridge is a very cute sub urban community in Northern Westchester County, New York. 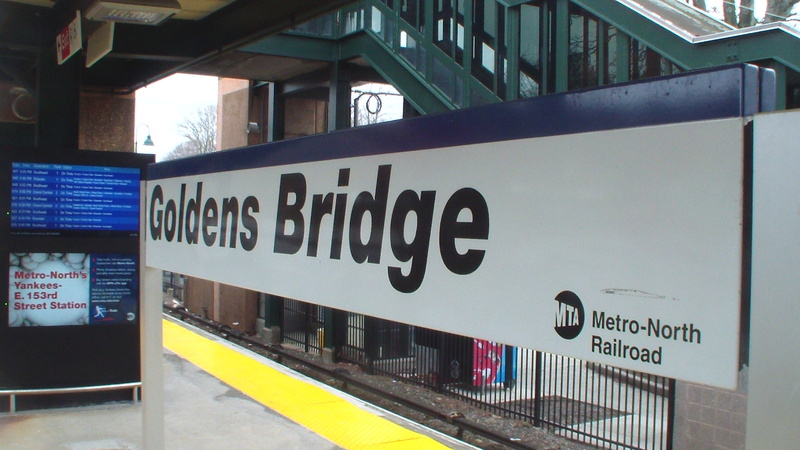 The Goldens Bridge Station is 43.7 miles away from Grand Central Terminal. This station serves the Metro North Railroad Harlem Line. Mostly electric trains stop here. There are about eight diesel trains that run during the rush hours on weekdays and four of those diesel trains stop at this station while the other four do not stop at this station. However, there are two diesel trains that operate on weekends and they both stop at this station. Diesel trains are used to travel up to Wassaic and back to Grand Central Terminal. All of the other trains terminate at Southeast. Southeast is the northern most station the electric trains can go, go figure. But anyways, that’s the story, ho ho!. I saw the MNR sign for Goldens Bridge when i was at my 4th trip to Squantz pond (search in the internet or google maps). Wilber lara on I have fans in Oklahoma!